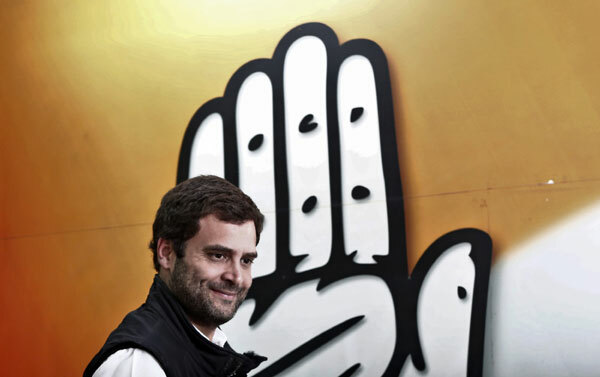 Fourth-generation Nehru-Gandhi family scion, Rahul Gandhi, looked set to enter the political fray as ruling Indian National Congress nominee for prime minister ahead of parliamentary elections this May. Several top Congress party leaders stated that it was just a formality for Congress to name its vice president (Gandhi) to take on the Bharatiya Janata Party’s Narendra Modi, who’s way ahead in the prime ministerial campaign, according to the latest polls. Pressure to name Gandhi as the ruling alliance mascot intensified after prime minister Manmohan Singh ruled out a third term for himself. At what was billed as his last official press conference on January 3, Singh strongly backed Gandhi for the top job. However, on January 16, media reports quoted a Congress party spokesman as saying that Gandhi would not be formally named as the party’s prime ministerial candidate. Instead Rahul was appointed the Congress Party’s election campaign chief. Market research agency Ipsos concluded that only 14% of voters in India’s most populous cities favored Gandhi as prime minister in a survey conducted in early January, compared with an approval rating of 58% for Modi. With degrees in international relations and philosophy from the United States’ Rollins College and from Trinity College, Cambridge, 43-year-old Rahul’s great-grandfather, Jawaharlal Nehru, was India’s first prime minister. Rahul had short stints in corporate jobs like the London-based Monitor Group, a management consulting firm, and Mumbai-based Backops Services, an outsourcing firm, before he finally took the plunge into politics in 2004. He currently represents the Amethi constituency in parliament’s lower house. His father and former prime minister, Rajiv Gandhi, hitherto won the same seat. If Rahul finally becomes prime minister, he will be the fourth person in his family to assume the top job.